There is utter ferocity in stillness. As the bell rang, the air seemed to cease all movement and quiet descended upon the dojo. When Seminars take place, there is an elevated level of sincerity, a tone of digging deeper within ones self to be present, aware and prepared to be pushed into new challenges and perspectives. Seminars offer us the reminder that in practice, we are engaging in something much deeper and much more threatening than technique, we are engaging ourselves. 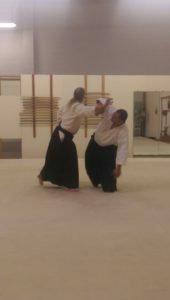 As Sandoval Sensei began the first Iaido class on Friday evening, this understanding was nourished. “You must be like an eagle, diving for a fish.” Silent. Graceful. Wholehearted. Deadly. As this comparison sprang out like the enlivened tip of Sandoval Sensei’s blade, “Eye of the Tiger” began to sound through the walls from the recording studio next door, and our seminar was underway. As we approached training on Saturday, the mat was full of life and hunger. Friends, old and new, had arrived from up and down the west coast from Washington to California to train. 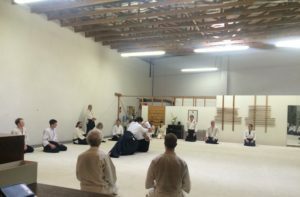 The first class, taught by Isaih Fernandez Sensei, got our blood pumping and our bodies moving and responding to one another and presented an opportunity to establish trust in our fellow Aikidoka, and ourselves. As we moved forward through the afternoon we were challenged by Sandoval Sensei to become more open, lively and connected. This challenge may seem, through paper, a run of the mill endeavor, but this was not your average seminar in any way. Through word and action, we were reminded that connection moves beyond our physical interactions with our training partner, it begins the moment our hearts and minds engage and is ever-present in each moment on or off the mat. Our connectedness can often be shallow, and we incorporate mistruths into our practice in forgetting the serious nature of ourselves and the spirit of our budō; in a way, we often cheat ourselves, missing opportunities to truly be present daily, often unaware. This call to true connection was commanded fully through the utter sincerity and humbleness of our guest teacher and struck into the heart of budō; we had found something new and precious to hold onto. There is no greater offering than sincerity. 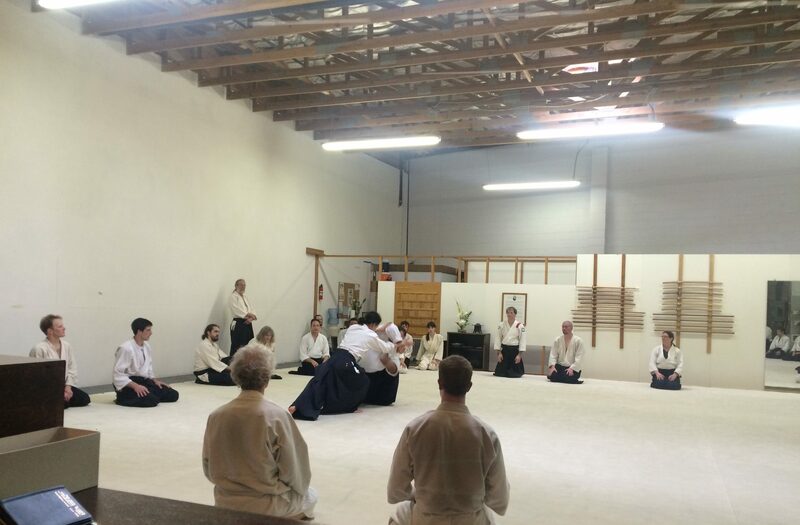 Sunday morning began with Thoms Sensei teaching a class with Sandoval Sensei as Uke. Thoms Sensei, a student of Kanai and Chiba Sensei’s, has ferocity within his aikido that commands Uke to engage without hesitation, Eye of the Tiger. Watching these two men together, we were not being shown technique, but something much greater, and much more rare. 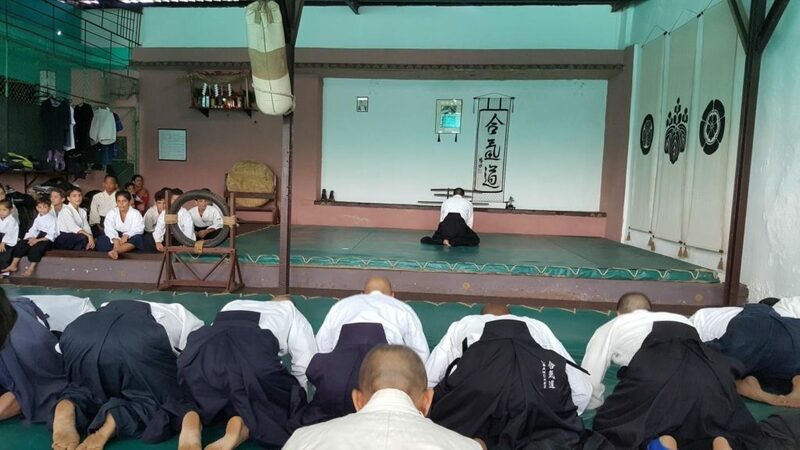 This was, in reality, Sandoval Sensei’s first class of the day. 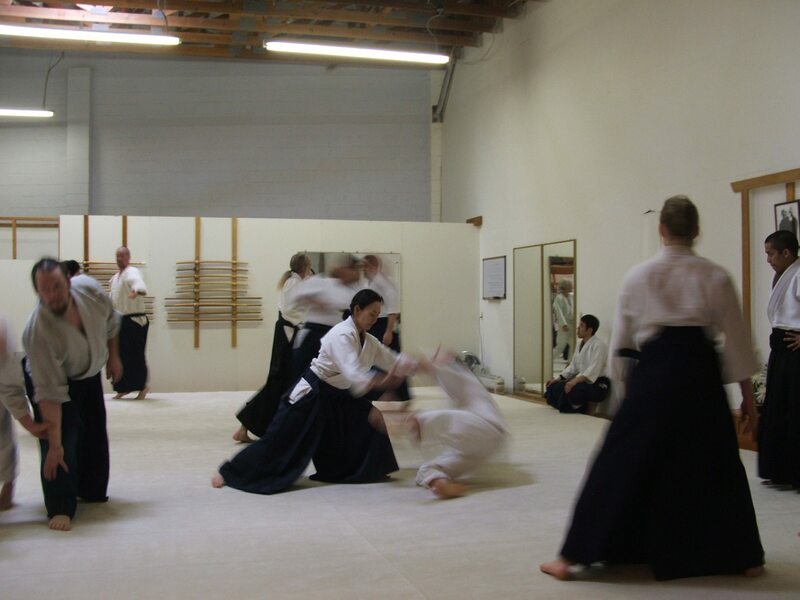 As he absorbed and responded to each unforgiving movement, we were being offered insight as to what would be expected of us ahead, we were being shown the heart of Chiba Sensei’s teachings, as interpreted through his student, we were bearing witness to true martial connection. Sunday’s classes addressed basic techniques on the deepest of levels. We were called to cultivate the under-acknowledged depths of our center, to find ourselves and to fully inhabit the space which our bodies occupy. It is a curious thing, the quest for understanding, and we were left shaken. Shaken in the way you feel glimpsing a trout’s back curling beneath the waters edge, or standing beneath a 1,000 year old tree, or holding a newborn child, shaken in spirit. 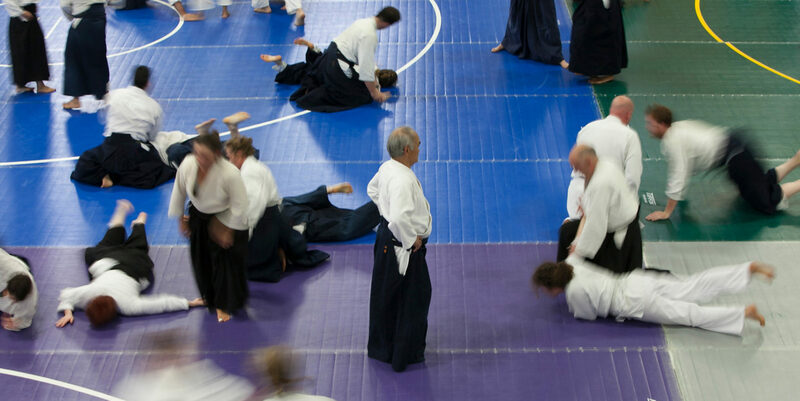 “It is truly a beautiful thing.” There is no term to describe the gift we receive when fully present and able to perceive what is being offered to us, but I am sure each practitioner of Aikido, new or old, understands that moment. 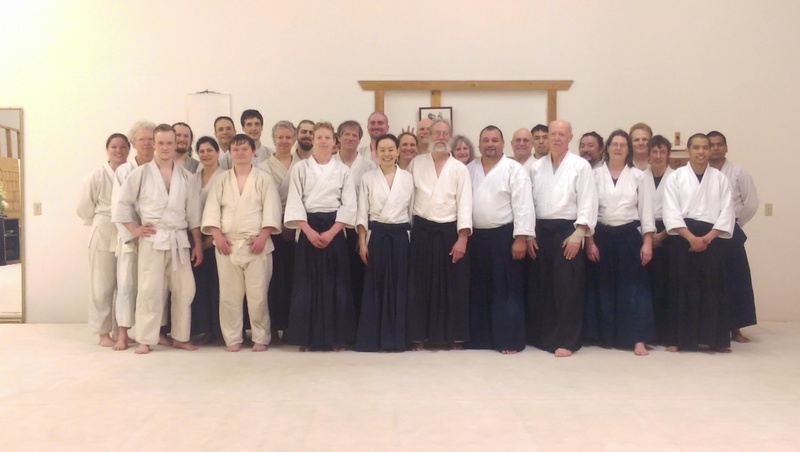 Sandoval Sensei extended this offering through the entire Seminar through wholehearted connection, evoking our humbled spirits within, and delivered to us the grace of an eagle, eye of the tiger, and heart of budō. The conveyor belt stopped and my luggage had yet to come out. 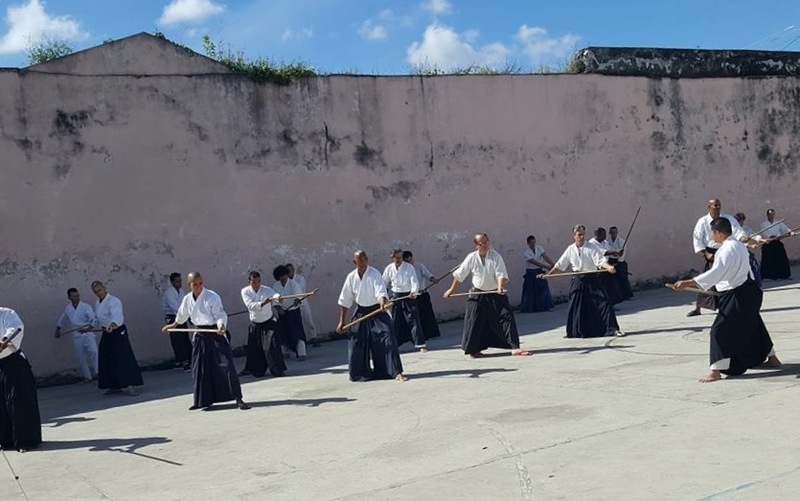 Three long hours after landing in Cuba, I was forced to accept the fact that my checked-in baggage had gone missing – along with my clothes, toiletries, and (most disconcertingly) my keiko gi and hakama. 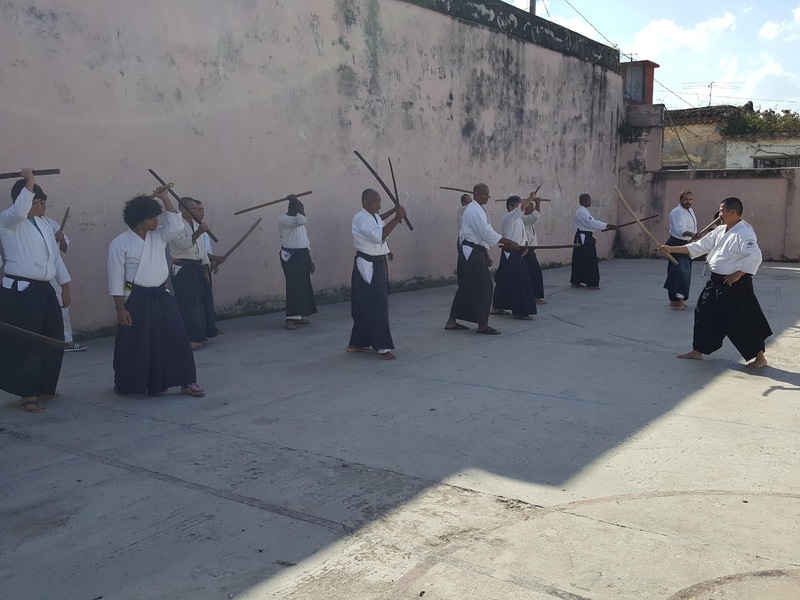 About two months prior, my teacher, Elmer Tancinco Sensei of Alameda Aikikai, invited me to attend a seminar which he, in turn, was invited to teach in Havana, Cuba. As is known to most, Cuba has been closed off from the United States and has had limited contact with the outside world for the better part of five decades. During that time, economic strife has plagued most of the inhabitants of the island nation. Most of the local populace working for the government would only earn an average of $20 per month. Even those in a specialized profession such as computer programming would only make a meager $30 per month. Very few have ever had the privilege and/or finances to own a car. And many people have had to turn towards off-the-books work in order to subsist and support their families through their day-to-day lives. These conditions have persisted up until present time despite relations between Cuba and the United States finally beginning to thaw. Right from the get-go of the trip, I found myself already being faced with a fair bit of adversity. We touched down at Jose Marti Airport on November 11, 2016, at approximately 1:30 pm. And by around 5:00 pm, when airport staff had finally surmised that someone else mistakenly took my luggage instead of their own, I had finally resigned myself to fate and was leaving the airport without most of the belongings that I packed for the excursion. Nonetheless, I was determined not to allow the setback to tarnish the rest of the trip. Ironically enough, the scarcity in personal belongings made me feel somewhat more sympathetic to the local populace. And if the people of Cuba could gladly persist in the conditions under which they are forced to live, I could surely manage my predicament with no great destitution. Besides Tancinco Sensei, I travelled in the good company of Patricio Jaime Sensei of Houston Aikikai and Dave Mata Sensei of Grand Rapids Aikikai. We were assisted by two representatives of the Cuban Aikido Federation: Ricardo M. Garcia Sensei and Angel Mata Sánchez Sensei. To my great appreciation, upon finding out about my missing luggage, Angel Sensei offered to lend me a spare keiko gi to use during the seminar. Humorously enough, he kept apologizing in advance, explaining that the gi would apparently be grey and stained due to the difficulty of procuring clean/proper training equipment in his country. He also later expounded that much like Japan in the aftermath of World War II, Cuban Aikido practitioners would frequently obtain a hakama by having to create one using any materials that were available to them such as spare table cloths and curtains. Such is the meager life of our generous hosts. The day of the seminar came the following morning. Angel Sensei met and presented me with the keiko gi he promised: a thin, mildly stained gi top with coarse gi pants. He joked that what the gi was lacking in cleanliness, it made up for in the energy and power it contained. As comical as his statement was, I could not help but think that there was truth behind the humor: The gi was in such a ragged state because of all the figurative (maybe even literal) blood, sweat, and tears that its owner had shed in order to persist training Aikido in such a poverty-stricken country. I humbly accepted the garments, packed my and Tancinco Sensei’s weapons, and went off to the training site. 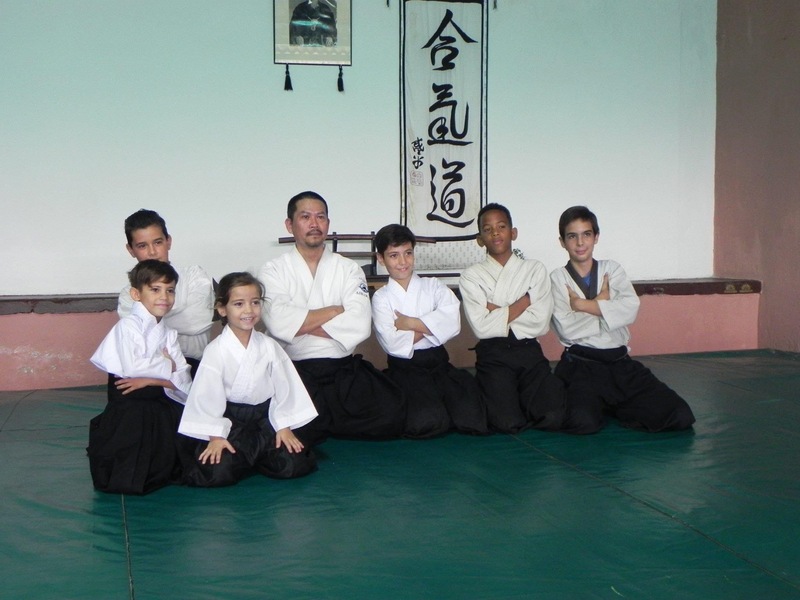 After about a 30-minute drive through some pot hole-riddled side streets, our troupe was dropped off at a small dojo in the middle of Havana where about 40 Aikido students of different ages and backgrounds were awaiting our arrival. I began changing into the unfamiliar keiko gi shortly thereafter. The jacket was light and of the wrong size. And the pants were very stiff and rough to the touch. Nevertheless, I promised myself that I would abide by one rule through the course of the seminar: remain centered and just train. No matter what problems and no matter what distractions I was experiencing, they were likely no worse than what my training partners have been going through their entire lives. Surely I could persist through a mere weekend of scarcity. To start off the event, Ricardo Sensei informed us that their youngest students would like to perform an Aikido demonstration for us. We watched the demonstration in pleasant surprise as the kids put on an energetic and tightly-executed show. 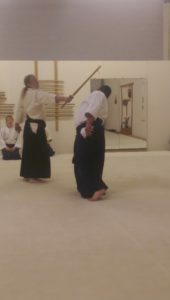 Suwari-waza techniques, breakfalls, tanto-dori, bokken-waza, randori – the children performed Aikido with a degree of centeredness and technical proficiency that would make many adult practitioners envious. The amount of discipline and dedication to the art displayed by the young Cuban students was a sight to behold and completely set the tone for the rest of the seminar. The seminar itself was lively right from the beginning. Setting up for a seminar that would come to highlight the strong connection between weapons work and body art in Chiba Sensei’s Aikido, Tancinco Sensei began with Suwari-waza Shomenuchi Kokyunage (Empty-hand Suriotoshi Variation). Despite being unfamiliar with the nuances of Birankai Aikido’s unique attention to martial details, the Cuban Aikido practitioners all did their best to adapt their prior training (which seemed to consist of an unusual blend of traditional Aikikai, Iwama, and USAF styles, among others) in order to try to absorb the knowledge they were being presented. All the while, Jaime Sensei, Mata Sensei, and I took ukemi for Tancinco Sensei and tried our best to help the Cuban practitioners understand the concepts being put on display. Jaime Sensei, in particular, took extra steps to help with translating everything being taught into Spanish. Everyone, including the kids, trained with much vigor and enthusiasm. And although there were some apprehensive students who preferred to watch the class by the sidelines, there was not a single sign of lethargy on the mat. By the time the first two classes were over, everyone had smiles plastered on their faces and I had already forgotten about my luggage problem. 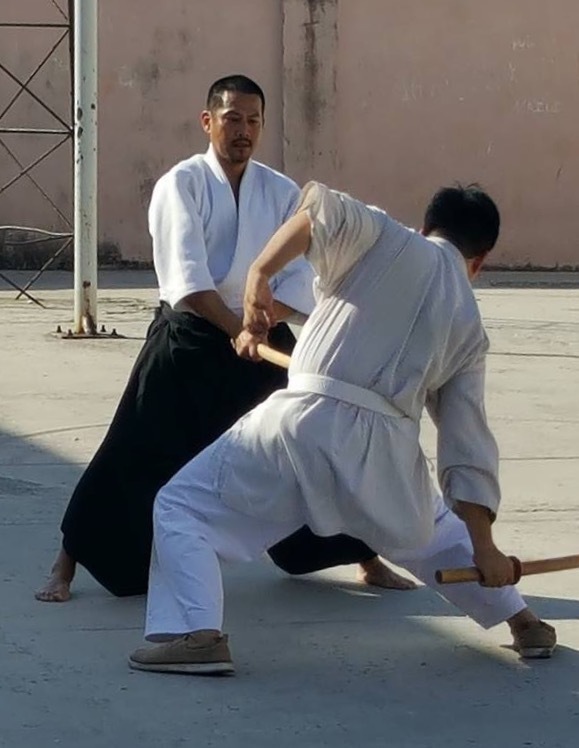 The afternoon came and the focus shifted into bokken work. It was then that I was faced with a poignant representation of the strife that the Cuban people were experiencing and had to overcome in their daily lives. As students and teachers all funneled into an outdoors courtyard where the class would be held, I noticed many of them carrying various makeshift implements in place of bokkens: shafts of bamboo, pieces of driftwood, sawed curtain rods, and many other forms of crude equipment. They were going through such hardship that many of them were forced to wield items such as tree branches as training equipment. Yet, when the class started, they trained with such passion and energy that one would think they were holding real swords in their hands. Tancinco Sensei introduced them to Birankai’s basic bokken exercises and techniques such as Makiotoshi, Suriotoshi, and Suriage. They devoured every piece of new knowledge – savoring every moment they could spend honing their art under a guest instructor from outside their country. What they were using in place of bokken did not matter; they did not mind that they were using unorthodox – even poor – equipment. All that mattered was that they were given the opportunity to receive and absorb precious new knowledge. After the class, everyone returned to their homes – eager to find out what the next day’s training session would bring. And with much patience and plenty of help from Angel Sensei and Ricardo Sensei, I was finally able to retrieve my luggage from the airport that same night. Once again equipped with my trusty gi and hakama, I was prepared for the last class of the seminar. Sunday came and the seminar resumed into its final leg. The focus was on jyo work, and the Cuban Aikidoists again showed up with their bamboo shafts, curtain rods, and tree branches. That day was indubitably the portion of the seminar with which they were the most unfamiliar, especially since Chiba Sensei’s jyo curriculum contains some especially intensive martial concepts and drills. This fact was no more apparent then when Tancinco Sensei first introduced Sansho 1A to them by calling me up to present the form with him at full speed. I will never forget the unmistakable look of suppressed terror combined with unbridled excitement and uncertainty that was embossed upon their faces – for it was probably the same look each of us currently training in Birankai once had when we first saw Chiba Sensei’s Aikido on full display. Senior student or long time teacher – it did not matter at the time. They were all beginners in the face of such an intensive form. And they responded by training with the greatest asset belonging to a novice: a beginner’s mind – Shoshin. The Cuban Aikidoists all trained with such surprising adaptability and openness that I was shocked to see that many of them, including a couple of children, had begun to embody the basics of the form by the end of the 90-minute class. As the seminar drew to an end, the Cuban students and teachers alike thanked our group for sharing our knowledge and assured us that they would gladly welcome us back anytime we wished to train among their ranks. As a symbol of our newfound friendship with the Cuban Aikido Fedaration and our appreciation for their hospitality, Tancinco Sensei and I donated our bokken and jyo to Angel Sensei and Ricardo Sensei. Moreover, with Dave Mata Sensei’s collaboration, Alameda Aikikai and Grand Rapids Aikikai are now planning a joint fundraiser seminar so that we could help the Cuban Aikidoists obtain quality replacements for their makeshift weapons. Through the course of my journey, I never once observed the Cuban people showing any propensity for giving up and folding under the pressure of their living conditions. If anything, they strove to subsist with unerring grace and calmness. They seemingly live their lives free of anxiety but are nevertheless constantly prepared for whatever their next trial may bring. It came to me that perhaps the Cubans’ outlook on training and life – a solid yet flowing centeredness – is the embodiment of Aikido. They only strive to control what they can – much like nage strives to control his own body and mind. By being centered and blending with the universe rather than resisting and fighting against it, everything else – all those other uncontrollable factors, such as uke’s aggression – will follow suit. Whatever trait one could conjure up to define a martial artist on and off the mat, these people carried it in their blood. They live and breathe the path of true budo each and every single day. As of November 19, 2016, I had returned to my home near San Francisco, California. However, my luggage had once again gone missing somewhere between our layover in Guadalajara and the flight back to San Francisco. But I no longer found myself worried about such an ordeal. 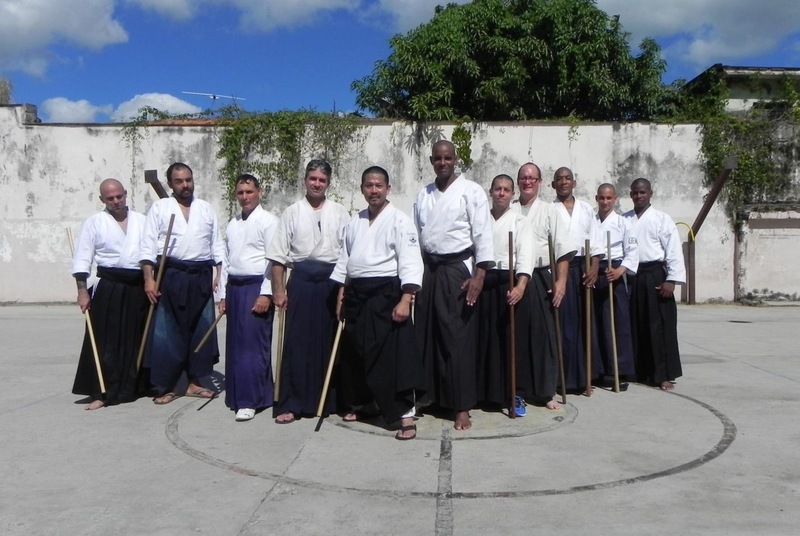 Our trip was primarily designed to teach our style of Aikido to the Cuban Aikido practitioners. However, it seems that I also learned a thing or two from them as well: Keep centered and everything else will eventually fall into place. We have almost reached our goal, you’re donation is greatly appreciated!